Hey there, how are you??? I've been busy working on a few projects over the past couple of weeks and I can't wait to show them of over the next little while! 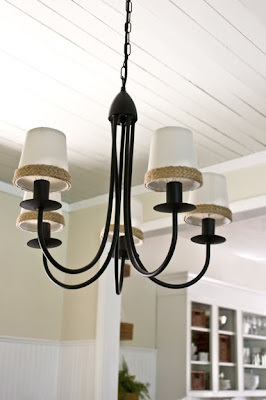 Today, I'd liked to share a quick little update I did to our dining room chandelier. 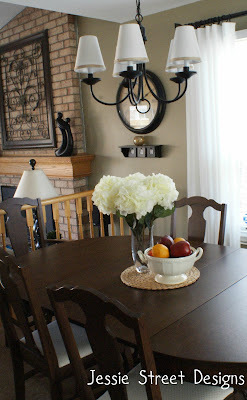 I'm a big fan of Kevin and Layla's blog - The Lettered Cottage. I love their ideas and have been admiring their house for months now. One of the updates they did was make their own Pottery Barn inspired lamp shade. Well, I LOVE anything Pottery Barn, so this immediately caught my attention. 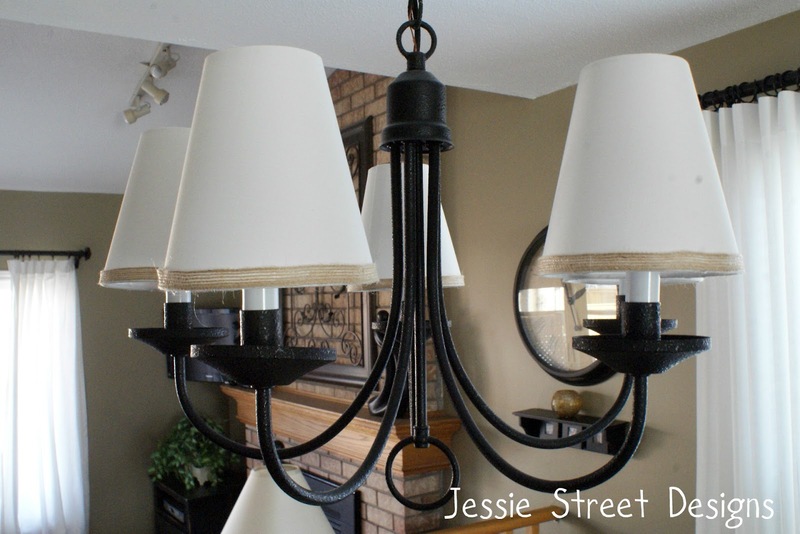 We have a similar light fixture in our house and I thought that this would be an easy update to try. All you need for this project is jute, a glue gun and lamp shade. It's pretty self explanatory, you glue gun the jute to the bottom of the shade - easy peasy and the results are terrific! I really like this subtle enhancement to the shade...it adds some visual interest, without standing out too much....it was just perfect!! So here is my creation, I couldn't find the braided jute, but found some jute ribbon from Michaels which worked perfectly. And because I just love my old but improved light, here's another shot of the final result in all it's glory!! I love this, it looks fantastic, Jenny! :) And I really think Freestyle Friday should be on your party list there, LOL. ;) Hope to see you over at Happy Hour Projects! I've been wanting to update the shades in our dining room as well. This is a great idea! 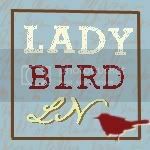 Thanks for linking up at Whimsy Wednesday.